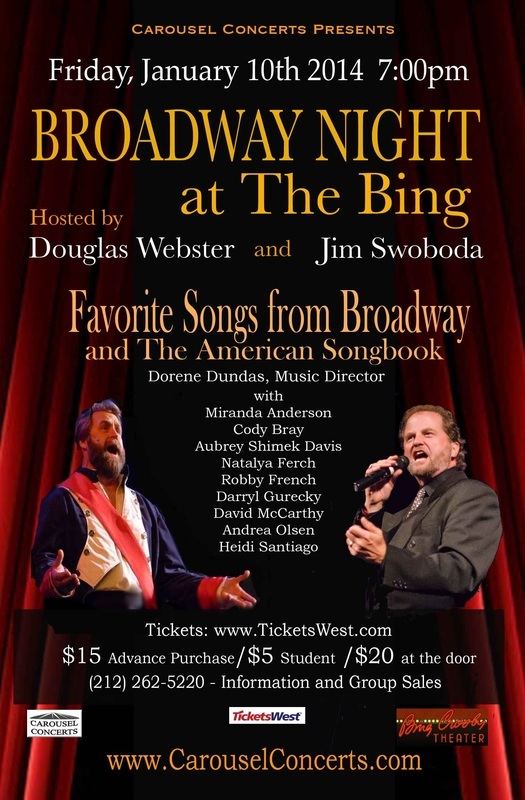 hosting an evening of Musical Theater highlights and songs from The American Songbook. Webster and Swoboda recently collaborated respectively as Stage Director and Star of the Spokane Civic Theatre's dynamic, SOLD-OUT production of Les Misérables this past Fall. BROADWAY at The Bing is an excuse to continue ONSTAGE together the laughter and collegiality they enjoyed OFFSTAGE during Les Miz. This time, Webster gets to sing and for this show, NO DIRT required on the actor's faces and NO ONE DIES! Joining them will be a few members of the Les Miz Family and Friends singing favorite selections from Musical Theater and The American Songbook. FULL DETAILS on CAST, TICKETS and PROGRAM will be posted soon!